I decided to distract myself from studying for tomorrow’s exercise science quiz by working on this sweet n’ spicy flank steak post instead. Seems legit, right? I’ll study after…I promise, but this is important too! I’ve been wanting to share this recipe for a while, but it took three times of making it before I could even get it documented. That’s because the first two times I made this, the meat didn’t go on the grill until after 8 p.m. (once I got home from working at the gym). In turn, this meant it was too dark to get a decent photo in the natural light. Anyway, as you can gather, I finally got it. You may want to keep this recipe in mind for the holiday weekend ahead! Place flank steak in a shallow glass dish or zip-lock bag. Season both sides with sea salt and pepper to taste. Meanwhile, whisk together the coconut oil, aminos, garlic, red pepper flakes and honey. Pour over the steak and make sure it’s well coated. Cover (or zip up bag) and place in the fridge for a minimum of 10 hours, but ideally overnight. Flip the meat over once or twice in the dish during the marinading time and if it’s in a bag, massage a few different times. Remove meat from fridge about 15-20 minutes prior to cooking. Then, place on a preheated grill and cook 3-4 minutes each side for medium done-ness (might be more, depending on the thickness). Remove meat from grill once done and let rest for 10 minutes before slicing. Serve with vegetable of choice. We ate sautéed broccoli and garlic with ours. Thank you! 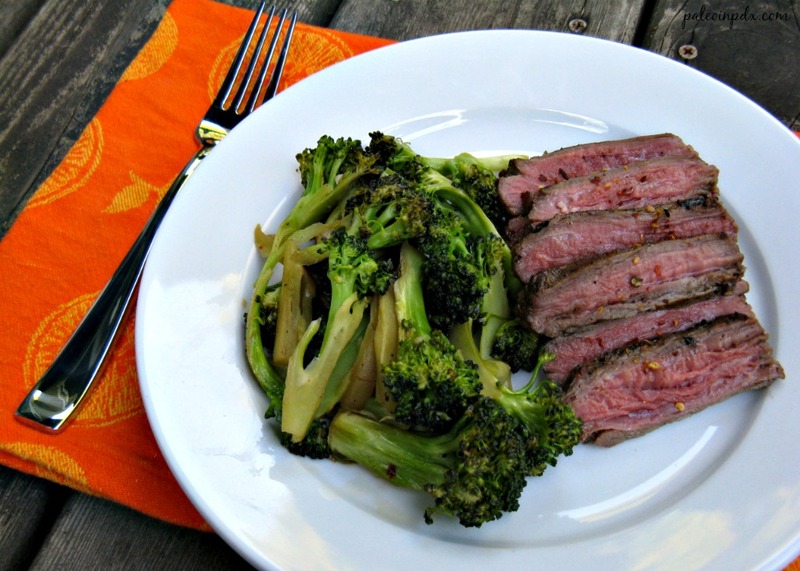 It tastes amazing and is now one of my go-to steak marinades! Yum!!! I have a flank steak in my deep freeze! This sounds perfect. Glad you were finally able to post it. I hate racing daylight. 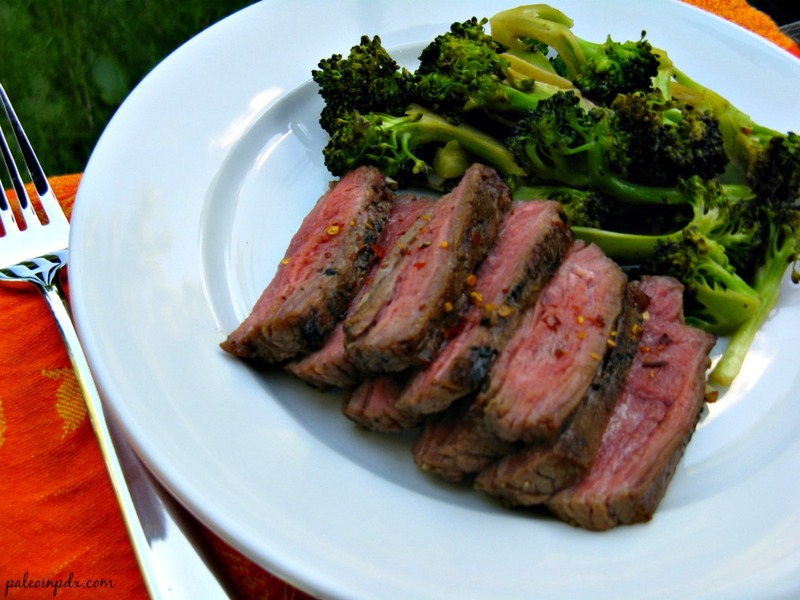 It’s a good reason to take that flank steak out of the freezer, for sure! Agree with the other commenters, this looks amazing! Will definitely have to try.